To anyone passing by Estero High School stadium Saturday, the sights and sounds of football were familiar. Dozens laced up their shoes and stretched out their calves to support families of law enforcement dealing with the feeling of loss. 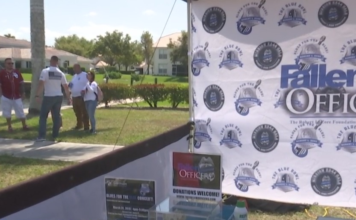 Fallen Officers, The Robert L. Zore Foundation’s first annual PNC Bank Blue Bowl co-ed flag football tournament took place at Estero High School on Saturday. Zore, whose father died in the line of duty, helped organize the flag football tournament. Here, teams of local business and law enforcement competed. The registration fees to participate benefited the families of Adam Jobber-Miller, Fort Myers Police officer, and Ben Zirbel, Clay County deputy. With days left in his campaign, Ron DeSantis (Rep.), gubernatorial candidate, made an appearance at the event. 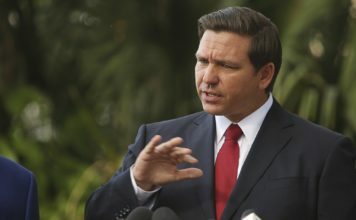 “You, when you put that uniform on, you are making the decision that when push comes to shove, you will sacrifice your own well being for the defense of others,” DeSantis said. For officers like Jasmine Lee, it was an opportunity to honor the ultimate sacrifice. “If anything was to ever happen to me, I know my people would have my back and support me,” Lee said. Everyone plays together to support the cause at this event. “It might get a little competitive, but everybody just has fun,” Lee said. This is something every competitor and community member could relate to. “They’re just like us,” said JR Fredell said, team quarterback and general manager at Rick Hendrick Chevrolet in Naples. “They’re mom’s they’re dads, they’re sons, they’re daughters, they’re children. And just like us, just like every member of my team, they have somebody that loves them.